Bake 2 lobster tails – I don’t really know how long, about 12-15 minutes at 425˚. I just check it after 10 minutes to see if it looks close to solid white. (Do not overcook, slightly undercooked is best since it will cook enough later). When cooled to handle, cut into small pieces but not too tiny – various sizes work best for texture and presentation. Hollow out mushroom stems (I only use Crimini Mushrooms) and pour a small amount of extra virgin olive oil (just enough to fill bottom) and some finely chopped garlic into the mushroom cavities. 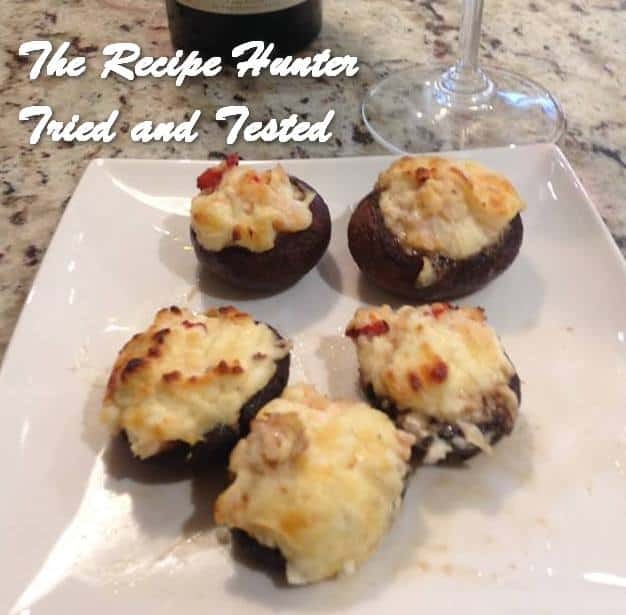 I use about 1/2 -3/4 small tub plain cream cheese (well softened), mix in I guess about 1/4 cup fresh parmesan cheese (the petals type I get at Costco – NEVER the dry Kraft types) and mix in the lobster. No blenders or mixers, I just use a spoon. Scoop lobster mixture into mushroom caps. Put into an oven pan. I cook at 450˚ but again I don’t know how long. I check after about 10 minutes and check back every few minutes until it looks browned, like in the picture. I suggest letting it sit a few minutes bit before digging in (as hard as it is to do) because it is extremely hot and get badly burned – speaking from experience. You can squeeze a small amount of fresh lemon on it if you like. Next time I think I will try soaking a little red wine in the mushroom cavities first rather than olive oil. I have not tried this yet, but I think it would make it even more delicious. I have always made these with real crabmeat, but in a can. Still very good and I will likely do again when I want them but don’t plan ahead, but I think after these lobster ones, it will almost always be fresh lobster or fresh crab from now on. Big difference, but much more costlier of course. Lobsters were on sale this week. Sorry it is not a regular recipe but it’s just something I throw together and unfortunately I didn’t plan for a nice presentation.